This is the Frequently Asked Questions Page. The most commonly asked questions are answered here. Many of the questions or concerns that prospective clients have can be found here. If you are unable to find the answer to your specific question, we invite you to contact us. We respond to all inquiries within 2 business days. Click the relevant question to display the answer. 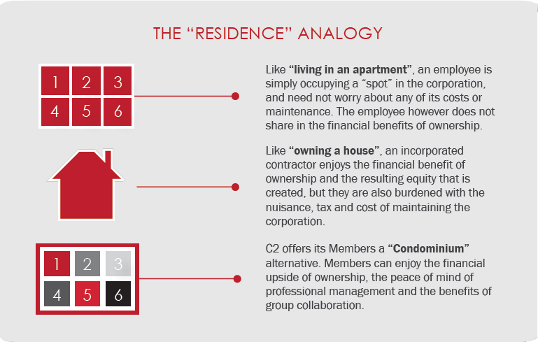 What makes C2 different than me working with my accountant, my financial advisor and lawyer? Having everyone working together collaboratively to meet your unique needs makes a world of difference. We each bring our professional expertise to support you in achieving your goals and dreams. We can include your current business service professionals into our C2 protocols should they show equivalent expertise and interest in your financial wellbeing. Will I need to stop using my current accountant, lawyer or financial advisor? No. We will happily work alongside any professionals you want to bring in to support your plans. Will C2 grow its offerings to businesses to help support business in other ways? Yes. If there is something you’d like help with and you don’t see it listed, just contact us. We’d love to talk and hear what it is you need. You may give us the start we need to develop other, new products. Or perhaps one of our consultants can help you, or we can provide a reference to someone that can help you. Why should I get a Master Synopsis? This is a key estate and business planning tool. It allows you to easily see what threats there are to your business, any opportunities you could enjoy, and any structural issues that could affect your bottom line now or in the future. It’s an easy way to determine your net worth. Why would I get a Corporate Check-Up? The Check-Up looks at your corporate health from a structural and financial perspective. If your corporate Minute Book isn’t current, it can be a problem with your estate, or with selling your business. We are happy to discuss financing strategies that can benefit you, including ways to optimize your net worth. We can help you assess corporate products to determine if they meet your needs. Learn about what you’ve got, and what might be missing. Can you help me get my corporation in place or do the things I keep putting off? Yes, we can help you do those tasks while you focus on your key business. Contact us for further discussion. What could possibly happen if my corporation's not structured well? Businesses are exposed to risk. As an owner, you want to ensure you and the company are not exposed to unnecessary risk. A poor structure brings those risks back to you personally and to your business. Businesses and personal property are sometimes lost as a result of risk exposure. We can help you protect yourself, your family and your company from the effects of those risks. How does this compare to income by salary or as an independent contractor? By earning through a corporation, contractors and professionals have the opportunity to income split with their spouse or partner, reduce CPP and EI contributions, and retain cash in the corporation at a lower tax rate. The benefits of incorporation are accompanied by responsibilities: tax filing requirements, managing GST, tracking expenses, and keeping corporate filings current. These responsibilities can be a drain on productivity. How does profit sharing work? Any savings or additional income C2 can realize for the group over and above the income of each division will be shared among all of the Member shareholders. Is my contract being pooled with other Members? No. Each contract and its cash flow are assigned by you, the Member. There is no pooling of funds across Divisions. We are pooling expenses, not income. Do I have other options to manage my income besides salary or dividend? Yes. There are a number of programs that Members can subscribe to in order to increase cash flow or to take advantage of available tax exemptions. C2’s professional advisors will consult with you to review the options and chart the appropriate course. How do I transfer my current contract? In most cases, a Member can simply direct his or her existing contract to pay C2. We will help you do this. If my contract is terminated with the third party, do I still get benefits? 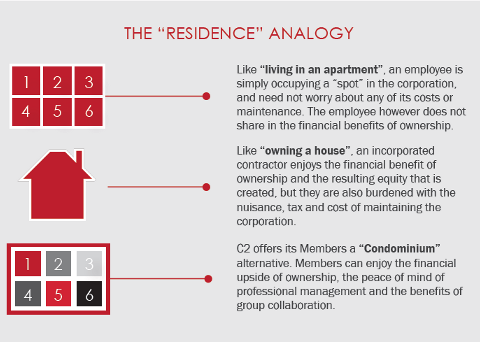 Our Member’s shareholdings in C2 are not connected to employment; however, salary, benefits and dividends are based largely upon division income. Once the Member or C2 is successful finding a new contract, salary and benefits can resume. What are my responsibilities if I create a corporation? Corporations have their own separate tax filing requirements (year end may be different than the end of the fiscal year), GST must be managed, expenses tracked and annual corporate filings kept current. Don’t worry though – we offer a comprehensive accounting package as part of our service to you. The package is for your corporation, you and your spouse or common-law partner – you determine how best to use the package. How does CRA determine if a business is a Personal Services Business (PSB)? If you answer “yes” to several of the following questions, you are at risk of being assessed as a PSB. Do you have one or only a few clients? Do you use your client’s tools and equipment? Is your client’s name on your business cards? Do you work at your client’s place of business most of the time? Are you in your client’s phone directory? Are you being contracted for ongoing services? Would the client absorb the risk if a project went over budget? I've heard that Personal Services Businesses (PSBs) do not meet CRA criteria. What happens if I am deemed to have a PSB by CRA? If you have retained income in your corporation over the past years and are paying the general 14% or 25% rate, then you are at risk of having that income re-assessed at rates and penalties upwards of 50% as far back as 2011.